Directions to Stop #3: The next tour stop is located about one half mile west of US Highway 69 on State Highway 52. Get headed south on US Highway 69. Travel about 8.5 miles south on US Highway 69 and take the exit for State Highway 52 (West). 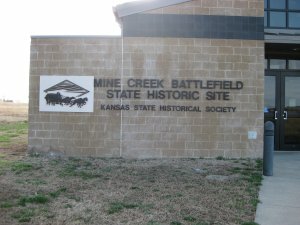 Travel for about one half mile and you will see the sign for the Mine Creek State Historic Site. Turn left and park in the parking lot. This tour stop is located near Pleasanton, Kansas 66075. Description: You are now at the site of the only battle fought in the state of Kansas during the American Civil War. This battle is considered by many to be the largest cavalry battle of the entire war. There were more than 6,000 Confederate cavalrymen from the divisions of Marmaduke and Fagan formed in line of battle just north of Mine Creek. Facing them about 1,000 yards to the north were about 2,500 Federal cavalrymen from the brigades of Philips and Benteen. It was the morning of October 25, 1864. The situation for Price's Army was precarious. It was strung out over a distance of 8 miles from Mine Creek to the Little Osage River. Price himself was encamped at the head of the column about eight miles south along with Shelby's Division. He planned to attack Fort Scott and capture what government stores were there. Marmaduke's Division had been given responsibility as rear guard for the retreating Confederate army. Marmaduke was back at Mine Creek dealing with a difficult situation there. Mine Creek is a small stream but the ford along the Fort Scott road is difficult and dangerous. Both banks are steep (10 to 25 feet) and treacherous. The ford had a rocky bottom but the far side bank was steep and was now slippery after most of Price's wagon train had already gotten across. The other two available fords have muddy bottoms and are generally not passable by wagons during wet weather. Around 11:00 A.M. Marmaduke found that the Mine Creek crossing was blocked. Because of the heavy rains the creek was a raging torrent. The two available fords were backed up with over 100 wagons still trying to get across. To further complicate matters, a wagon had overturned and was now blocking the ford. Marmaduke had planed to get across and set up his rear guard defense on the south side of Mine Creek. But now Marmaduke knew he needed to hold off the advancing Federals from the north bank until the remaining wagons could get across the creek. He send word back to get support from Fagan's division. The Visitor center has a number of interpretive displays explaining Price's Missouri Expedition. Inside the Mine Creek Battlefield visitor center you'll see Civil War-era uniforms, learn about the eyewitnesses to the battle, and see weapons from the battle. The best part of the site is the interpretive walking trail out in the middle of the battlefield. The 1.6 mile Prairie Loop passes through the area of the battlefield north of Mine Creek. The 1.2 mile Timber Loop traverses the area south of Mine Creek. Make sure you get a copy of the Walking Trail Brochure. The next eleven tour stops (3.1 through 3.11) follow the tour along this walking trail. 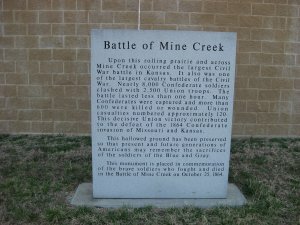 There is another excellent brochure called the Battle of Mine Creek Kansas. It contains maps that show the location of the roads that existed in 1864 relative to the roads present today. This brochure is a great reference to use during the remainder of the tour.